The chatbot phenomenon has finally exploded in healthcare, and it is poised to be a goldmine of labor savings and improved patient engagement. Most of us have interacted with chatbots for years. Remember the last fraud alert text from your bank to verify a transaction? Yes, that was a bot. Some of us are old enough to remember when a live human used to make those calls. Even that simple chatbot saved the banking industry millions, and many similar opportunities exist in healthcare. What’s more, chatbots aren’t even all that hard to build anymore. This blog post was written by Mark and John Ulett at Toehold Learning. Software developers have created a wide variety of new, inexpensive tools in the last few years that make chatbots incredibly easy to build and effective to implement. From free and low-cost tools for simple bots—and full suites of tools for artificial intelligence-powered bots—the chatbot world is becoming everyone’s oyster! The advantage of simple, low-cost tools is that you can experiment and prototype bots before investing tens or hundreds of thousands of dollars on a project. Better yet, you can create it yourself for almost no money in just a couple of hours. Learning by doing is always more valuable than merely reading about something. 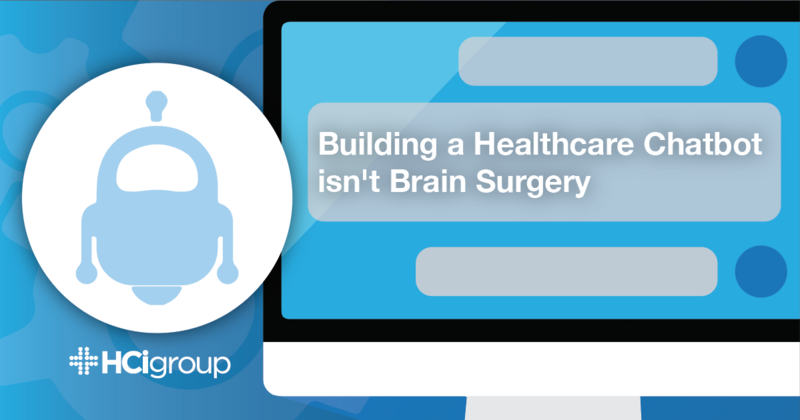 In this post, we’ll give you a taste of how easy it is to build your own healthcare chatbot. Put simply, chatbots are interactions between people and machines that mimic human conversation. They can be initiated by the user or by the bot. Chatbot conversations initiated by the user tend to be more complicated because humans could ask almost anything. Then, the bot needs to use natural language processing (part of artificial intelligence) to recognize what the user wants to know. For example, a chatbot that checks your symptoms would need to interpret the same symptom described in several possible ways: “I feel nauseated,” “my tummy hurts,” “I wanna puke.” Chatbots that use AI tend to be harder to build than simple bots. There are much simpler chatbots that are single-purpose and initiated by the user, like a chatbot designed to help order a pizza. The purpose is very narrow, and it’s much easier for the chatbot to control the flow of the conversation—from “I want a pepperoni pizza” to “your order is being delivered” in just a few steps. In healthcare, an example of this kind of bot could be a simple physician-finder chatbot located on a website. The patient wants to find a doctor, and the chatbot will help guide them through a narrow set of options to find the right physician for their needs. Chatbots designed to initiate the conversation with the human can be even easier to build. The bot controls the conversation from the start and guides the user through collecting the necessary information. The chatbot could be designed to collect a patient’s blood pressure or their blood glucose and alert a caregiver when a metric is outside acceptable limits. The chatbot could text: “Hello, Tom. It’s Glucobot here, just checking in to find out what your evening blood glucose level is.” If the result was too high or low, then that could trigger a follow-up call from a nurse navigator to check in with the patient. These kinds of bots are easy to imagine and relatively simple to prototype. We have already listed a few examples of chatbots, including Glucobot and the physician finder. Here are a few more use cases to show the wide range of possible uses for chatbots in healthcare. Population Health Gaps in care Find out where and when a particular procedure (mammogram) was performed. Immunizations Schedule a pneumonia or flu vaccination for appropriate patients. Transitions of care Either follow-up by the discharging provider or scheduling for primary care after a patient is discharged from the hospital. Alternative form of care The CPC+ measures require providers to offer alternatives to in-office visits. You could build a chatbot to fulfill this requirement. Education/Patient Engagement Living with diabetes As a part of a formal diabetes education class, have the chatbot follow-up on glucose levels, reinforce education in the classroom between sessions, and then follow-up at the end of the class. Nutrition classes Have the chatbot ask someone how many servings of fruits and vegetables they have eaten that day and remind them to eat well. Operational Medication adherence Post-discharge. Check to see if the patient picked up the prescriptions, understands the frequency and is experiencing side-effects. Hip/knee replacements These surgeries have very predictable after-care patterns. A chatbot could remind patients of discharge instructions regarding bleeding, swelling, and movement/rehab. New hire engagement After an employee accepts the job, a chatbot could help the company engage with a new hire and provide them with useful information and reminders. Each of the above use cases potentially improves outcomes without significantly increasing labor expenses. Doing more to engage patients, care providers, and the staff is a golden ticket in healthcare, and chatbots hold tremendous potential to fill existing gaps.